Diverse, innovative, dynamic and competitive are just a few adjectives that could be used to describe the social enterprise sector in Manitoba. These businesses play a critical role in our local and provincial economies, but also fill fundamental gaps in our social security net. By providing training and employment opportunities, or serving cultural environmental missions, social enterprises are making Manitoba more sustainable, equitable and economically robust. Manitobans have a rich history of finding innovative and collaborative solutions to community challenges. Social enterprises are one of the fastest growing approaches to building stronger local economies while serving important social mandates. 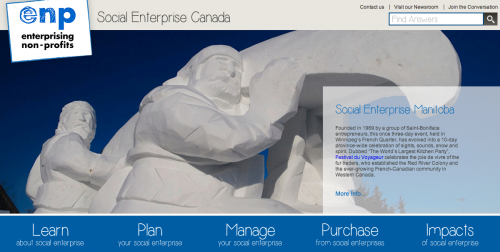 Visit the website www.socialenterprisecanada.ca, recently launched by Enterprising Non-Profits and the Social Enterprise Council of Canada, to find information on a wide variety of social enterprise development topics from across Canada. This highly effective, informative and interactive session provides an overview of the ‘what and how’ of social enterprise. Learn about the steps of development for social enterprise and hear lots of examples of successful Canadian social enterprises. All participants will receive a copy of Enterprising Non-Profit's comprehensive Canadian Guide to Social Enterprise. Organizations must attend this workshop to be eligible for an enp-mb Social Enterprise Development Grant. Enterprising Non-Profits Manitoba is made possible by the following funders.